Many of us love dogs and see them as an extension of the family. Consequently, it makes sense that you may want to include your dog as part of your wedding celebrations in some way. For our latest post, we take a look at the various considerations to make when including your dog into your wedding and the ways in which they could become a part of your big day. Before giving your pet a starring role, be sure to consider your pet’s personality and how they will feel being part of the celebrations. Even if you have the most well-behaved pet, there’s no guarantee that they will play the part you want them too on the day. Having a dedicated pet sitter to take care of your dog(s) throughout the day will not only put your mind at ease that they aren’t getting into any mischief, but it will also give your pet the reassurance that they need throughout the day to remain calm and well-behaved. There are many ways you can incorporate your little furry friend into your wedding, but why not kick things off with a canine-themed save the date or invite? You could hang a lightweight sign or chalkboard around your dog’s collar, announcing the date of the wedding, or snap a pic of your pooch holding the sign in its mouth. If your dog is too small or too excitable to display the sign, you may simply have a photo of you and them with the date details underneath. Your save the date cards and invitations are the perfect opportunity to get creative and share your theme or style with your guests, as well as pay a special homage to your pet. You may have dreams of your pet walking down the aisle bearing your rings, however, if they are not allowed in your ceremony venue, don’t fear. You could have a pet sitter bring your dog to the venue, ready for photos to be taken outside. 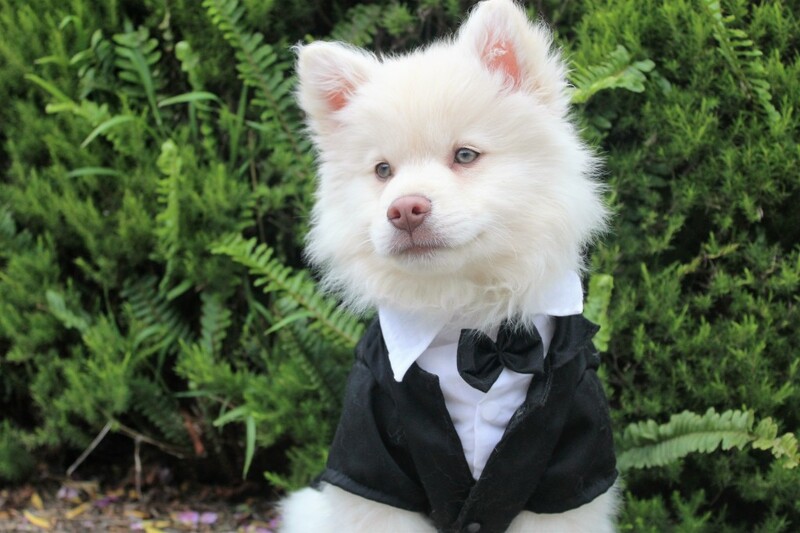 If you don’t live far from the venue, a guest could sneak off to bring your dogs to you once the ceremony is over. You may not want your dog at your wedding reception for the whole celebration, but if you still want to incorporate them in some way, consider using photos of you and your pet as cards for the table numbers, or even have them join you and your partner as a cake topper on your wedding cake. Whilst we can’t offer you any furry companions for your big day, we have been helping happy brides-to-be to choose their perfect wedding dress for many years. Whether you know exactly what you want or need the guidance of our team, we will gladly help. To make an appointment, call today on 01234 714401 or book an appointment through our handy booking form.